Let’s put this straight: having an opinion can be the secret sauce for a popular blog. I am not saying that this is an essential factor. There are several styles that work online. Some of them are more neutral, where the author drops his personal views only occasionally, and overall he keeps a balanced tone and asks the perspective of other people often. That is more or less what Darren uses on Problogger, and the one I aim to as well. Having a clear and strong opinion about things, and expressing it on your blog, however, can be equally (if not more) effective for generating traffic and buzz. Yet very few people use this style. I wonder why. Here are two examples that illustrate my point: Loren Feldman and Victor Franqui. Loren Feldman is the guy behind 1938media, a video blog that cover all sorts of Web 2.0 topics, often in a satirical manner. Loren does not have a problem if he needs to kick things (to avoid saying something else) around. If he does not like something or someone, he will spill it out as raw as he can. Through out his videos he generates a great deal of controversy, and he might also gain some haters along the way, but as a result he is becoming one of the most popular video bloggers around the web. Victor Franqui, also known as Vic, is the author of Blogger Unleashed. Although he started that blog only some months ago, he already has 2,400 RSS subscribers, and it is not rare to see some of his video posts with over 100 comments. The reason? Vic is very straight forward about his opinions. I am not saying that I agree with all of their opinions (in fact I disagree strongly with some), but I can’t deny that they have cojones for expressing them so clearly and so strongly. Of course such a strong opinionated style is not for everyone. You must have it inside you, else it would just be evident that you are faking it. The problem is that many times people that do have strong opinions refrain from expressing them because they are afraid of what other people might think. Another point to notice is that perhaps it is easier to communicate opinions over video than it is with writing, so video bloggers might have an advantage here. In my opinion, women NEED female friendship. Actually, I just did a presentation at PodCampOhio about how Web 2.0 is about being social – and the research I found is that women are all about being social, and having female friendships. Thanks for reminding me to voice my opinion and making an inspirational site that makes a difference to women’s lives. @Michael, that is true for me as well, but most of the times I wont necessarily let my opinions become so visible in the post as those guys do. I usually won’t blog about something unless I have an opinion about it. I don’t want to be just another blog that is part of the echo chamber, but if I have something to add to the story, whether it is a new take on it or maybe some experience I’ve had with the story than I’m actually contributing to the blogosphere without adding any more noise. I’m traditionally a bit of a fence-sitter, but soon after I started blogging I realized the need to have an opinion. I think this has helped me develop intellectually, as it forces me to spend a little bit more time clarifying my thoughts on particular topics. 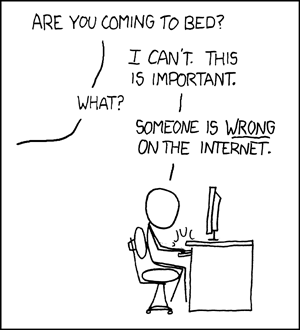 You might want to add the link to XKCD to the post too or at least mention his stuff if you’re going to use the image in this context. I think that I should try doing some video soon. It can help express points that written words can’t. My goal this summer will be to create a video cast at least once a week until I get the hang of it. Video is not for everyone, so I’ll check back in and let you know how it’s going. I think there are still so many thing be a popular blog besides this point .. I think you hit the nail on the head here. Anyone who has thought about making money from what they write has realized that it is very easy to misconstrue the written word. There is no tone of voice. No hand gestures. No facial expressions. Most of the posts on my blog express my opinion about one thing or another. Great one Adam :), just added it to the post. Everyone on the Internet knows what they are talking about, supposedly :).